BeadQuest 2019 is the TBOX Mardi Gras Pop-Up Bar Crawl and Crawfish Boil, hosted by Big Brother Reality TV Star Brett Robinson as Mardi Gras King! 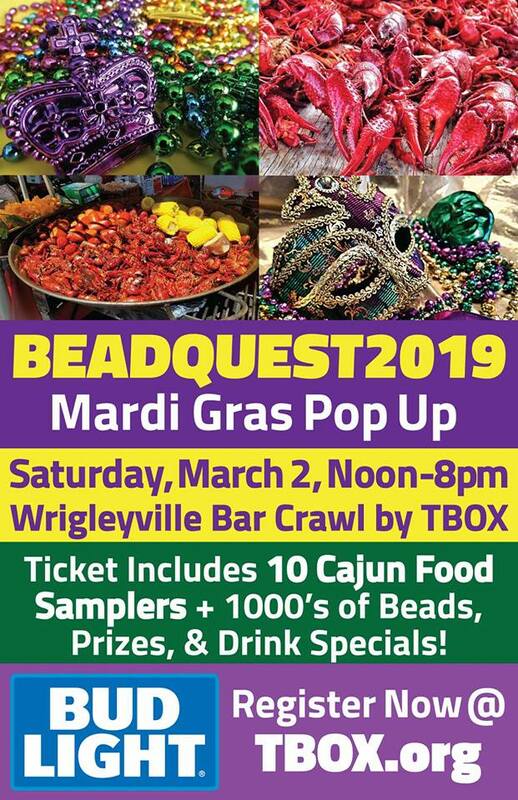 BeadQuest is Saturday, March 2 in Wrigleyville, Chicago. Enjoy 10 Free Cajun Food Samples from Local Bars & Restaurants, Collect Tens of Thousands of Beads to win fabulous prizes, drink authentic New Orleans Hurricanes in festively decorated Mardi Gras venues, as TBOX brings BOURBON STREET to CLARK STREET from Noon to 8pm! BeadQuest is Chicago's Largest, Longest-Running Mardi Gras Celebration, now in its 11th Year, and will include great bars like Deuce's & Diamond, Old Crow Smokehouse, Sluggers, Cubby Bear, Country Club, Stretch, Brickhouse, and More! Starts with Crawfish Boil where you get a free sample - then you visit your choice of 16 bars, get 10 food samplers, and go on a mission to find 10 collectible Mardi Gras Beads from Southern Comfort. The event ends with a big prize drawing and finale dance party at Rizzo's. And Ladies can compete to be our Mardi Gras Queen with Brett Robinson and enjoy VIP privileges for the day! BeadQuest is an event not to be missed - and includes TBOX Souvenir Chicago Flag Gym Bag for first 2,000 Registrants too!